or just want it for what it is, more power to you! 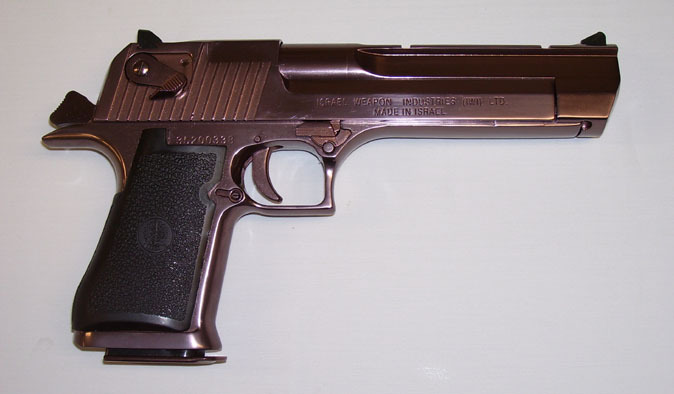 There is nothing like the famed Desert Eagle. 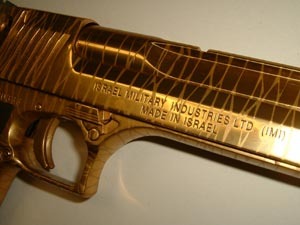 What a gun! Not quite a sensible choice for a first (or second!) 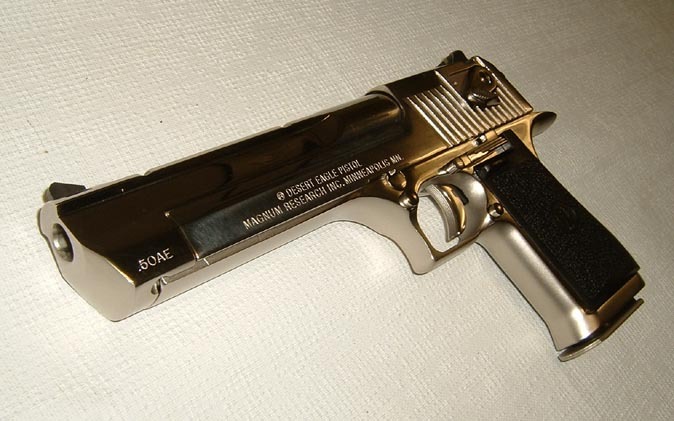 handgun, or what one would expect to fire every week. 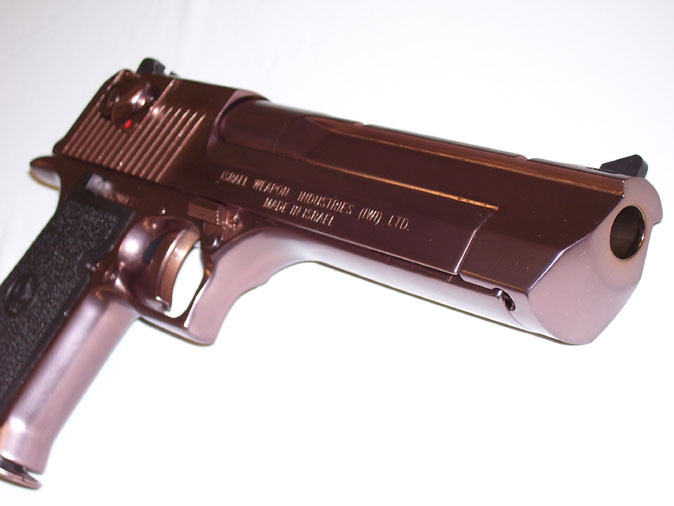 Blued finish (although cheapest) rusts easily so a smart idea is one of the custom finished guns as seen here. 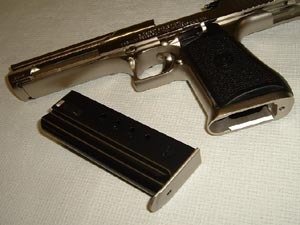 Blued finish is a matte black color, retail $1,563. Advance order $1,430. 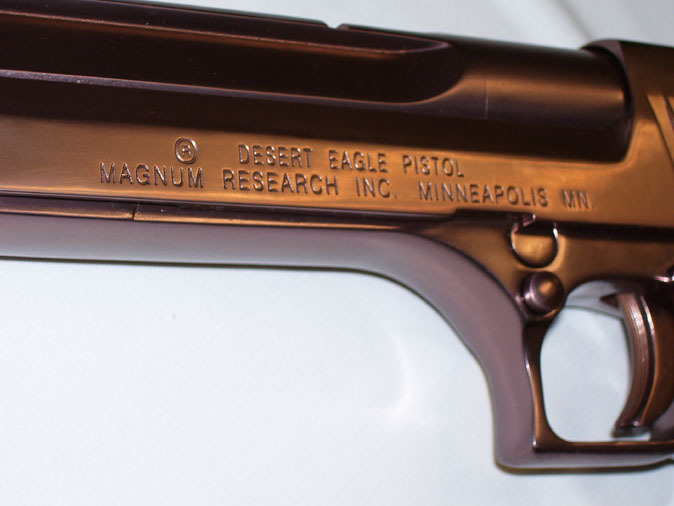 Desert Eagles ship with one mag. Hammer cocked, safety on. 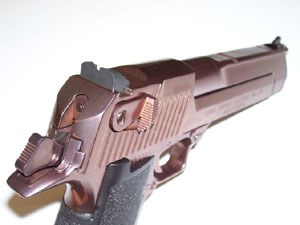 Slide-mounted safety has to be up for fire. 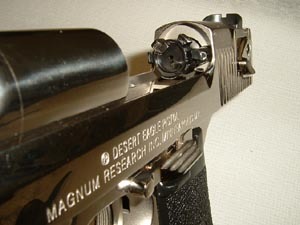 Desert Eagle has two stage trigger. 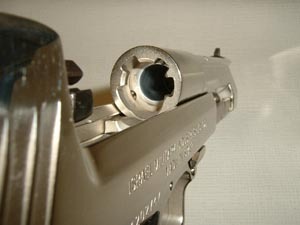 Top of barrel is designed for mounting rings and optics directly to it, maximizing consistency of shooting. 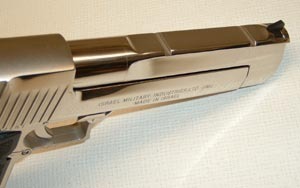 Titanium Carbon Nitiride is another finish variation of the custom finished Israeli semiauto magnums. 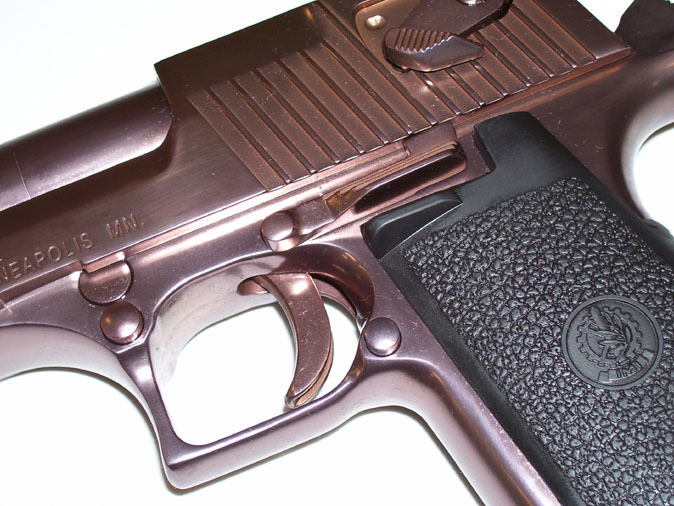 TCN: a tough finish, refreshingly different in a gunmetal-pewter color. This finish is no longer produced. 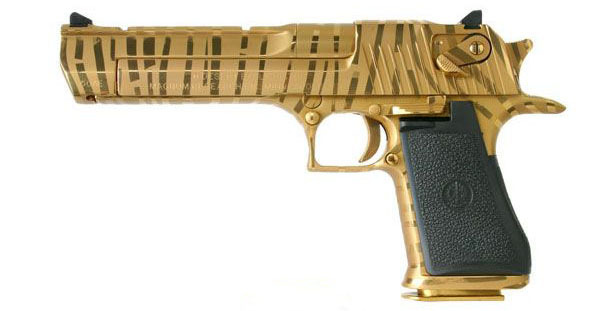 They would have been at the same price bracket as the 24K Gold or Tiger Stripe Gold. Retail $2,070. 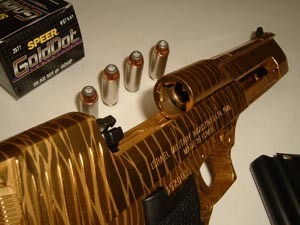 Titanium Gold Nitride Tiger Stripe, in .50 Action Express. Retail $2,070. 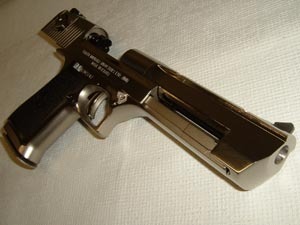 Advance order price $1,890. 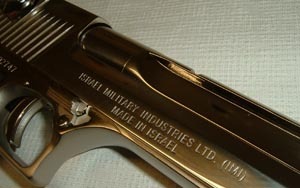 For impressive firearms collections or for hitting steel silhouettes at distance. 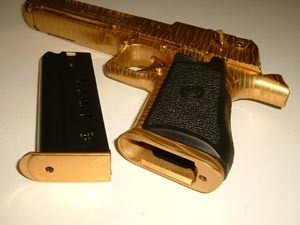 24K Gold finish same price. like those in pictures above. 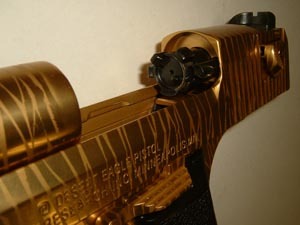 Tiger stripe version is not readily available; might find some in gun auctions. 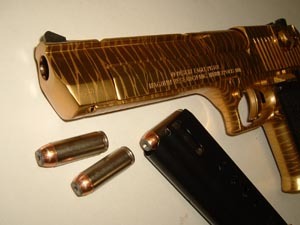 Another example of a beautiful Desert Eagle, in Bright Nickel finish. 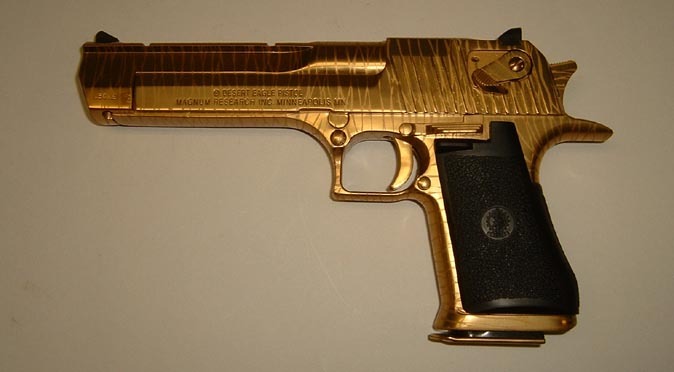 Retail $1,838. Advance order, $1,680. 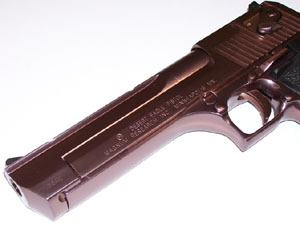 As a comparison, a matte blued (and easily rusted) Desert Eagle retails at $1,563. Advance order, $1,430. 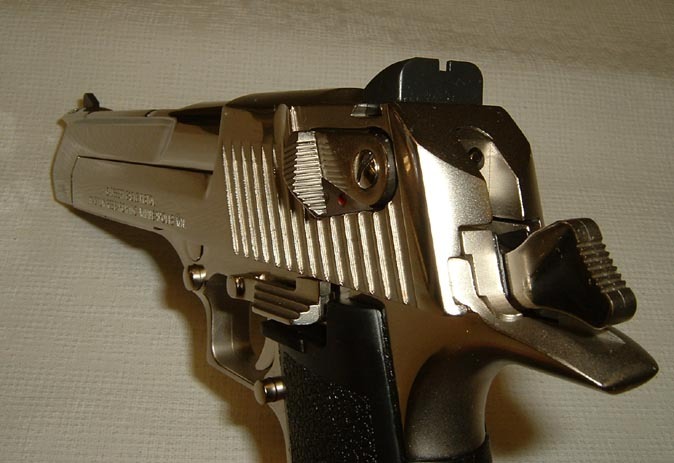 Other custom finishes in this category: Satin Nickel, Matte Chrome, Brushed Chrome, Polished Chrome. All are in the same price bracket at $1,838 suggested retail. 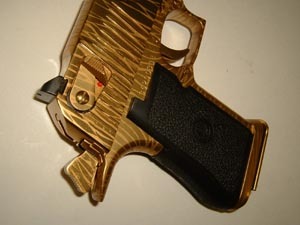 If prepaid, advance order price is $1,680.